Finally, we have a bit of clarity in the NBA 2K League. While the last few weeks have done little but make things murky, week seven did us all a favor and made things just a bit more clear regarding the playoffs. We can start marking teams down as “very unlikely” to make the playoffs and give a few more an advantage as much of the league competes for those coveted playoff spots. Here are five takeaways from an interesting week of NBA 2K League action. Not that it really changes much. They’re still in first place and they’re still the best team in the league. But it may mean they finally succumbed to their habit of not always playing at 100%. They came out firing in the first quarter and then… well, they didn’t look at all like a team that had ripped off 11 straight wins this season. It was always inevitable. It’s hard to go 14 games unbeaten within a single season and this team wasn’t quite strong enough to do it (not that that’s a discredit to them. I mean, they’re 7-1). The important part now is to not let this affect morale. Going a long time unbeaten and then dropping a game sometimes leads teams to crash down. It could also mean they no longer have the pressure of going undefeated so they can keep their sights set on the title. Either way, winning the regular season is not the ultimate goal of the NBA 2K League. Winning the playoffs is. I’ve been holding off on this, but it’s time: Knicks Gaming and Warriors Gaming won’t make the playoffs this season. There. I said it. I wanted to be conservative with such declarations this season. This is a league where anything can happen, and it feels like any team can rattle off, like, six wins in a row and throw a wrench into every narrative possible. But at 2-7 and 1-6, let’s call it like it is. We won’t be seeing the Knicks or Warriors play any meaningful games until game one of season two. I can’t exactly pinpoint why this season has been such a failure for the Knicks. I don’t think it was any one reason, but a myriad of them. I won’t get into them now but if you watch the tape from the past few weeks it has been a disorganized and uninspiring mess. For the Warriors, they never quite figured out what they wanted to do. Even with the hiring of a former G-League assistant coach and playing the top two teams in the league real close, it’s time to face reality for them. They need to figure out who will be alongside Vert as they decide how to move forward into next season. There is of course always THE TICKET, which the winner of gets an automatic berth into the playoffs. But what about these two teams recently tells you they can rip off four straight wins in a high-pressure situation? I wouldn’t count on it. So that whole spiel I just went on about not counting any team out? Pacers Gaming is exactly why I wrote that. The once-elite then not-elite and now not-too-bad Pacers have clawed their way back into the playoff hunt with three straight wins after starting the season 0-4. And it’s definitely not out of the question that they can sneak their way in at the eighth seed. Though there are some tough matchups on their remaining schedule, there are also just as many winnable games. Steal a win against 76ers Gaming, Jazz Gaming, CLTX Gaming or Blazer5 Gaming and they’ve got themselves a real shot. This team is playing with confidence and needs to carry that through the rest of the season. If they can build on their current success then they may just surprise everyone. Not everyone is so fortunate as Pacers Gaming. Outside of the aforementioned Knicks Gaming and Warriors Gaming; Kings Guard, Bucks Gaming and Raptors Uprising did little to help themselves in week seven. Each of those playoff bubble teams took a loss that may prove to be mighty blows in their campaigns to make the top eight. And for each and every one of them, it came in a mostly uninspiring performance. It doesn’t mean they’re eliminated just yet, but in the NBA 2K League, every game matters. It’s especially tough for the Kings and Bucks in that they lost to other teams near them in the standings fighting for a playoff spot. Needless to say, the rest of the season for these three is going to be an uphill battle. 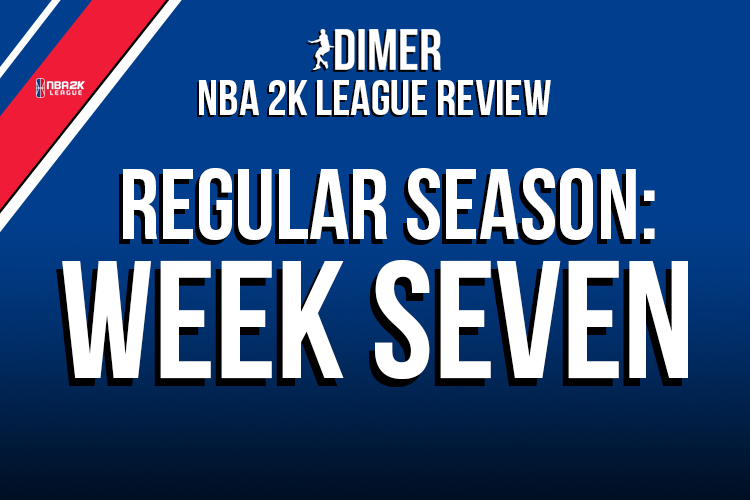 For Magic Gaming, Wizards District and Heat Check Gaming, however, week seven was a good one. Each team picked up crucial wins to bring all of them back to .500 and in a three-way tie for eighth place at 4-4. Wizards District currently has the tiebreaker as the only team of the three with a positive point differential, but with five weeks of the regular season to go, they’re all in much better positions than those below them, obviously. As it stands, the Wiz Kids have by far the easiest remaining schedule, and I’d put them as the early favorite among the three to make it into the playoffs. But a crucial matchup between the Wizards and Heat is set for week 10, and it could be the biggest game of the season for both teams. Keep an eye on the race for the final two playoff spots, because it’s going to be a good one. The league is really starting to take shape. As always, these aren’t entirely based on a team’s win-loss record. Regular season records are listed first while regular season plus TIPOFF and TURN records combined are listed in parentheses. They can’t beat the teams at the top, they can’t beat the teams in the middle and they can’t beat the teams at the bottom. Knicks Gaming has a lot of problems. I give them the nod over the Knicks because of their losses to the top two teams in the league by a combined six points. That at least tells me this team is on the cusp of being decent. A win to build on against Knicks Gaming. I like their current setup with AuthenticAfrican at point guard with DDouble at center and Universal Phenom at power forward. What a mess this team looks right now. Their offense is dysfunctional, their defense is unorganized and you can see the frustration in the faces of this team every single week. Their loss to fellow resurging team Pacers gaming may be the turning point in this season for the Bucks, and not in a good way. They’re still in it as far as playoff chances, though. What a win and what a run this team is on. They still have a lot of work ahead of them if they want to sneak into the playoffs, but with the way this team is playing and how much confidence they must have, it’s not out of the picture. They were definitely the better team against Kings Guard, and they only get knocked down a spot because of Heat Check’s quality win. It’s going to be a battle for them to secure a playoff spot. I had Jazz Gaming in the top three of my power rankings last week and Heat Check blew them out of the water. This team has been lurking in the middle of the league and they look ready to make their playoff push now. A good bounceback win by getting back to what they do best. Like I said above, they have the “easiest” path among the teams sitting at 4-4 of making it into the playoffs. They won in week seven, but I personally consider them the weakest of the five-win teams in the league right now. That doesn’t mean they aren’t good, but I need to see more from them against the top teams in the league. They beat the best team in the league, but if you read these power rankings every week you know that I’m into the whole cautious optimism thing. It’s also very hard to climb above teams at this point in the rankings. I was such a big believer in the consistency of this team, and then they had to go and get blown out by Heat Check. It’s a decently sized blow, but it’s not the end of the world for this team. They stay put, but it was a disappointing week for them. They were favored against the Wizards and jumped out to an early lead but let them get right back in it. I’ll keep saying it: the switch of Hood to power forward has probably been the most successful lineup switch in the league this season. This team is cruising and looks primed to contend for the title. Almost blew it against Warriors Gaming, but hey, they’re not the only ones to survive a scare against that team. This team is starting to wane itself off of three-pointers, and they still look good for it. They lost, but nothing really changes. Just their second loss total of the season, which is absolutely insane. They need to start playing at their own level every game, though.